The Nephrology Quiz and Questionnaire remains an extremely popular session for attendees of the Annual Kidney Week Meeting of the American Society of Nephrology. Once again, in 2014 the conference hall was overflowing with audience members and eager quiz participants. Topics covered by the expert discussants included electrolyte and acid-base disorders, glomerular disease, ESRD/dialysis, and transplantation. Complex cases from each of these categories along with single-best-answer questions were prepared and submitted by the panel of experts. Before the meeting, program directors of United States nephrology training programs and nephrology fellows answered the questions using an Internet-based questionnaire. During the live session, members of the audience tested their knowledge and judgment on a series of case-oriented questions prepared and discussed by the experts. They compared their answers in real time using audience response devices with the answers of the nephrology fellows and training program directors. The correct and incorrect answers were then discussed after the audience responses and the results of the questionnaire were displayed. As always, the audience, lecturers, and moderators enjoyed this educational session. This article recapitulates the acid-base and electrolyte disorders portion of the session and reproduces its educational value for the readers of the Clinical Journal of the American Society of Nephrology. Enjoy the clinical cases and expert discussions. For most American Society of Nephrology (ASN) Kidney Week attendees, case-based clinical nephrology talks are the most exciting venues of the meeting. The Nephrology Quiz and Questionnaire (NQ&Q) is the essence of clinical nephrology and represents what drew many of us into the field of nephrology. The 2014 NQ&Q during Kidney Week in Philadelphia, Pennsylvania, with full-house attendance, was no exception. The discussants prepared vignettes of puzzling cases, which illustrated some topical, challenging, or controversial aspect of the diagnosis or management of various areas of nephrology. These eight interesting cases were presented and eloquently discussed by our four expert ASN faculty. Subsequently, each discussant prepared a manuscript summarizing his or her discussion of the cases, which serves as the main text of this article. In this NQ&Q, Dr. Mitch Rosner presents his two challenging electrolyte/acid-base cases and eloquently synthesizes the available data to make the correct diagnosis. The audience responses are reviewed along with those of the training program directors and nephrology fellow obtained before the meeting, giving an interesting perspective into the thought processes of nephrologists with varying levels of training and experience. Dr. Rosner reviews essential clinical and laboratory data available in the cases and walks the reader through the diagnosis and appropriate management of these two challenging electrolyte/acid-base cases. Ultimately, he dissects the role of various medications in causing the metabolic disturbances for the readers. Overall, all participants had an educational experience. We hope that this “distillate” from Philadelphia will serve the CJASN subscribers well and provide some fresh insights into the complexity and vibrancy of clinical nephrology for those who were unable to attend the meeting. A 60 year-old man with a history of a heart transplant and stage 4 CKD was diagnosed with a gout flare 6 days ago and was prescribed prednisone, 30 mg daily; allopurinol, 100 mg daily; and colchicine, 0.6 mg three times daily, for the first 2 days and then colchicine, 0.6 mg twice daily thereafter. Before the gout attack, the patient had been feeling well and his baseline creatinine was 2.9 mg/dl with an eGFR of 29 ml/min per 1.73 m2. Other medications included mycophenolate mofetil, cyclosporine, pravastatin, carvedilol, calcitriol, and furosemide. After 48 hours of taking the allopurinol, colchicine, and prednisone, the patient developed nausea, intermittent vomiting, and profuse diarrhea. This continued intermittently over the next 2 days. However, during the past 2 days, he has developed worsening lethargy; muscle aches; and continued nausea, diarrhea, and abdominal pain. His family brings him to the emergency department (ED). In the ED, he was found to be confused, tachycardic, and hypotensive, with a BP of 76/42 mmHg and pulse of 120 beats/min. He then sustained respiratory arrest and was successfully intubated; he was also started on vasopressin, norepinephrine, and intravenous fluids to support his BP. Laboratory results at the time of admission are shown in Table 1. Figure 1 shows responses from fellows, training program directors, and audience. Answer for Case 1, Question 1a: What is the acid-base abnormality in this patient? The correct answer (*) is D. TPD, training program director. The patient presents in shock and develops respiratory arrest soon after his arrival to the ED. The laboratory studies reveal a mixed acid-base disturbance with respiratory acidosis and both anion and non–anion gap metabolic acidoses (choice D is correct). He has severe acidemia (pH, 6.91) with a predominant metabolic component (bicarbonate of 6 mEq/L) and a mildly increased anion gap of 16. In analyzing the acid-base problem, the next step is to calculate the expected Pco2, which can be derived from the Winter formula (expected Pco2=[1.5×serum bicarbonate]+8 (error margin ±2) (1). In this case, the expected Pco2 is calculated as 17±2 mmHg. However, the actual Pco2 is higher than expected (23 mmHg), so a concomitant respiratory acidosis is also present. In looking at the anion gap and the patient’s serum bicarbonate, it also becomes evident that a non–anion gap metabolic acidosis is also present. In this case, the additional anions contributing to the anion gap (16−12, or 4) can be added back to the current serum bicarbonate (6 mEq/L) to yield a serum bicarbonate level of 10, which indicates that a non–anion gap metabolic process is present as well. There is also a disproportionate increase in chloride relative to the serum sodium level, which also suggests that a non–anion gap acidosis is present. Thus, this patient’s severe acidemia is explained by three separate processes: an anion gap and non–anion gap metabolic acidosis as well as a respiratory acidosis. It is also worthwhile to assess whether the complex acid-base disturbance is consistent with the clinical picture. In this case, the patient’s severe diarrhea and loss of stool bicarbonate can account for the non–anion gap metabolic acidosis while the ensuing volume depletion and hypotension could lead to organ hypoperfusion and lactic acidosis. Finally, the combination of respiratory muscle weakness and central nervous system depression would lead to relative hypoventilation and respiratory acidosis. Also of note is that the patient had severe hypokalemia, which can contribute to muscle weakness and highlights the fact that this patient also requires potassium replacement. The other listed choices are incorrect, as the above analysis indicates. Which of the following drug interactions were likely responsible for the patient’s presentation? Figure 2 shows responses from fellows, training program directors, and audience. Answer for Case 1, Question 1b: Which of the following drug interactions were likely responsible for the patient’s presentation? The correct answer (*) is D. TPD, training program director. This patient has a complex medical history and has been receiving numerous medications with potential adverse effects and drug-drug interactions. Compounding the risk for these complications is the presence of significant CKD, which not only affects the clearance of many medications but also is associated with comorbidities that increase the complexity of drug regimens with ensuing risks for drug-drug interactions (2). Furthermore, many providers may not appropriately recognize the presence of CKD and thus endanger patients with inappropriate dosing and medication choices (3). In this case, the combination of colchicine, pravastatin, and cyclosporine led to a potentially deadly combination when combined with stage 4 CKD (choice D is correct). Colchicine is a widely prescribed and effective medication for the treatment of acute gouty arthritis. This mitotic inhibitor effectively terminates cell division and has anti-inflammatory effects due to inhibition of leukocyte migration and secretion of inflammatory cytokines (4). It also binds to tubulin and disrupts microtubular networks. Colchicine is excreted fecally (80%–90%) and renally (10%–20%). Furthermore, colchicine undergoes complex metabolism through the cytochrome P450 3A4 isoenzyme (CYP3A4) to inactive metabolites, as well as cellular efflux through P-glycoprotein (5,6) (Figure 3). Thus, colchicine toxicity is enhanced in the setting of CKD as well as with medications that inhibit its metabolism, such as CYP3A4 inhibitors (e.g., clarithromycin, azithromycin, cyclosporine, fluconazole, and grapefruit juice) (7). Furthermore, toxicity is augmented with inhibitors of P-glycoprotein, which leads to higher intracellular levels of colchicine. These P-glycoprotein inhibitors include statins (although perhaps not pravastatin based on in vitro models) and cyclosporine (8,9). Thus, this patient experienced significant colchicine toxicity due to the combination of CKD (reduced renal excretion), impaired metabolism (CYP3A4 inhibition from cyclosporine) and perhaps decreased cellular efflux (P-glycoprotein inhibition from pravastatin and cyclosporine). This was compounded by a high dose of colchicine, which was used to rapidly alleviate the patient’s symptoms. Of note, cyclosporine increases the maximum observed plasma concentration of colchicine as well as the area under the plasma concentration-time curve of colchicine by, on average, 224% and 215%, respectively (10). Thus, current recommendations are to decrease the colchicine dose by 50% when that drug is used concomitantly with cyclosporine. Further dosing reductions should occur with decreased kidney function. Toxicity due to colchicine follows from its mechanism of action to disrupt cell division and microtubular assembly. 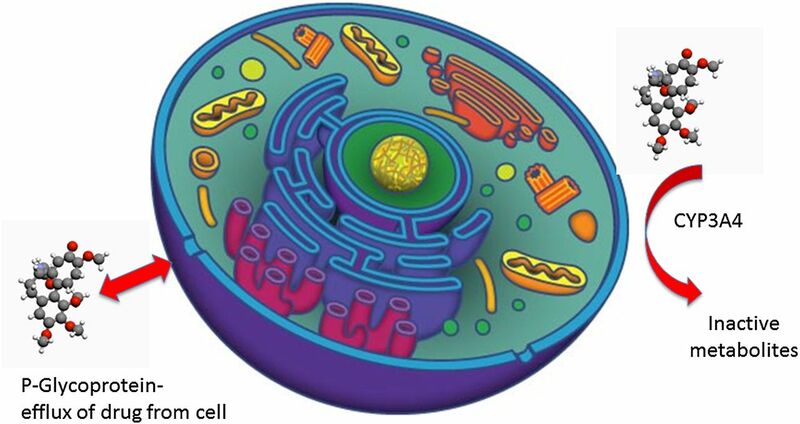 Thus, cells exhibit impaired protein assembly, decreased motility, inability to undergo cell division, and decreased endocytosis and exocytosis. Acute colchicine toxicity typically evolves through three stages. Stage 1 occurs 10–24 hours after ingestion and is typified by nausea, vomiting, and diarrhea. Stage 2 occurs 24 hours to 7 days after ingestion and includes multisystem organ failure (bone marrow suppression, liver injury, rhabdomyolysis, acute respiratory distress syndrome, and cardiogenic shock). In patients who survive this stage, there is a variable recovery period that can last weeks (stage 3) (11,12). Death is usually due to cardiogenic shock, acute respiratory distress syndrome, and multisystem organ failure. Survival depends on excellent supportive therapy, which includes rapid treatment of respiratory failure and hemodynamic compromise (12). Dialysis may be required to treat AKI as well as electrolyte and acid-base abnormalities. Case reports also suggest benefit of extracorporeal membrane oxygenation in severe instances (13). Because bone marrow suppression is common, use of colony-stimulating factors such as granulocyte colony-stimulating factor should be considered (14). 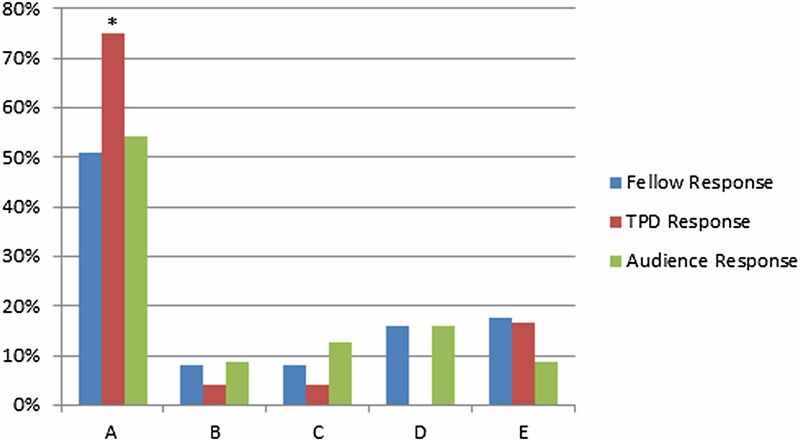 Because of colchicine’s extensive volume of distribution and extensive tissue binding, hemodialysis or hemoperfusion is not effective in drug removal. Fab antibody fragments that bind to colchicine and inhibit its toxicity have shown efficacy but are currently not available (15). Colchicine poisoning may also affect the kidney, and toxicity is more commonly seen with underlying CKD (16–18). AKI can be encountered but is not a direct effect of the drug on tubular cells but rather is associated with multisystem organ failure, volume depletion, rhabdomyolysis, and concomitant ingestions, such as nonsteroidal anti-inflammatory drugs (16–18). Electrolyte abnormalities, such as hypokalemia, hypomagnesemia, and hypophosphatemia, are commonly encountered (such as in this patient) and are most likely due to diarrhea and vomiting. However, one report describes Fanconi-like syndrome associated with colchicine toxicity (17). In more severe cases, lactic acidosis from multisystem organ failure occurs. Once again, supportive care, including dialysis if required, is the treatment of choice. In this case, the patient developed severe multisystem organ failure, including cardiogenic shock, respiratory failure, and AKI. He required initiation of continuous RRT. Over the course of 8 days, he showed signs of improvement and was subsequently able to be discharged to a rehabilitation facility. However, he remained dialysis dependent. Choices A and B do not involve colchicine, which is the major toxin in this case, and thus these options are incorrect. Allopurinol, mycophenolate, and prednisone have no significant interactions with colchicine; thus, choices C and E are also incorrect. A 37-year-old woman with a 3-year history of severe sinus disease and headaches is referred to you after several laboratory abnormalities were found. Her medical history is significant for two episodes of nephrolithiasis (no stone analysis was performed). On questioning she notes that pain and redness develop in her hands in cold weather. She takes no medications except for occasional antibiotics for her sinus problems. Her BP is 108/50 mmHg and her physical examination is unremarkable except for some fullness over her parotid glands. Her laboratory studies are shown in Table 2. On further questioning, she reports no drug abuse. Which one of the following laboratory tests would you order next? Figure 4 shows responses from fellows, training program directors, and audience. Answer for Case 2, Question 2a: Which one of the following laboratory tests would you order next? The correct answer (*) is E. TPD, training program director. This patient presents with a non–anion gap metabolic acidosis along with hypokalemia. Because her history is also notable for symptoms suggesting a collagen vascular disorder (parotid gland swelling, Raynaud phenomena) and there is no mention of significant diarrhea, distal renal tubular acidosis associated with Sjögren syndrome should be suspected and appropriate serologic studies obtained (choice E is correct). The differential diagnosis for a non–anion gap metabolic acidosis with hypokalemia is shown in Table 3 and includes, in broad terms, loss of potassium and bicarbonate in the stool (such as diarrhea or enteric fistulas) or renal tubular acidosis (RTA) (proximal or distal). The absence of a history of significant diarrhea and the symptoms suggestive of Sjögren syndrome should increase the suspicion that RTA is present. Another clue to this disorder being a renal tubular problem is that the urine potassium level is higher than what would be expected with gastrointestinal losses. The urine anion gap (UAG) can be helpful in determining whether urine ammonium excretion is appropriately increased in the setting of a metabolic acidosis. The UAG is calculated as urine (sodium+potassium)−urine chloride. Typically, with a Western diet, the amount of sodium and potassium that is absorbed from the gastrointestinal tract exceeds the amount of absorbed chloride; in the steady state, the amount of urine sodium and potassium typically exceeds the urine chloride and the UAG is positive, with a wide range of possible values from 20 to 90 (19,20). With metabolic acidosis, renal ammonium excretion should increase and will appear in the urine with chloride. Thus, in this setting, the urine chloride now exceeds the sum of urine sodium and potassium and the UAG is negative. Of note, urine ammonium was, until recently, very difficult to measure and a negative UAG is a rough surrogate for urine ammonium excretion on a qualitative basis (21,22). Therefore, a positive UAG is consistent with low or normal ammonium excretion and in the setting of a metabolic acidosis indicates impaired ammonium excretion (such as with RTA). A negative UAG is consistent with increased ammonium excretion and is typical of an appropriate renal response in the setting of diarrhea (19–22). In a few circumstances urine may contain an excess of unmeasured anions (such as with toluene ingestion [hippurate], diabetic ketoacidosis [β-hydroxybutyrate and acetoacetate], or long-term acetaminophen ingestion [5-oxoproline]) (23,24). In these cases, the UAG may be misleading because the unmeasured anions are excreted with an excess of sodium or potassium and cause the UAG to be positive and suggestive of impaired renal ammonium excretion. It has been proposed that the urine osmolal gap (UOG) might be a better surrogate marker for urine ammonium excretion because it is not influenced by the presence of unmeasured urine anions (25). The UOG is the difference between the directly measured and calculated urine osmolality. In normal states, ammonium is the major unmeasured solute that contributes to the urine osmolality, and with metabolic acidosis (with a normal renal response to increase urine ammonium excretion), the UOG should increase significantly (e.g., >75), reflecting the increase in unmeasured ammonium in the urine. A low UOG would reflect impaired ammonium excretion. However, even the UOG has limitations, such as when there are excess unmeasured nonammonium solutes in the urine, which may occur with alcohol ingestions or with urinary tract infections with urease-producing organisms. The diagnosis of distal RTA, as opposed to proximal RTA, can often be made by history, serum chemistries, and urine pH (a history of nephrolithiasis and a predisposing condition, hypokalemia, and a persistently elevated urine pH >5.5 in the setting of acidemia). The finding of a positive UAG (here +63) is confirmatory and effectively excludes gastrointestinal losses as the cause of the non–anion gap acidosis. Another confirmatory test is the infusion of ammonium chloride to generate a metabolic acidosis or the more recent test described by Walsh and colleagues whereby patients receive 40 mg of furosemide and 1 mg of fludrocortisone (26,27). With either test, healthy patients will acidify the urine to a pH<5.3, but those with distal RTA will not be able to achieve a urine pH<5.3. Thus, the history, laboratory, and urine values are all consistent with a hypokalemic form of distal RTA. In addition, plain radiographs of the abdomen may also reveal the characteristic calcifications in the kidneys associated with nephrocalcinosis. There are four subtypes of distal RTA, which reflect different pathogenic impairments in ammonium excretion by the distal tubule. Broadly categorized, these are a voltage defect, a hydrogen ion (H+) secretion defect, a H+ gradient defect, and an ammonium generation defect (Figure 5, Table 4) (28). However, only the H+ secretion and gradient defects are associated with hypokalemia. The other defects are typically associated with hyperkalemia or normal potassium levels. The α-intercalated cell and handling of acid balance in the distal tubule. Acidification of the urine depends on the entry of CO2 into the cell and its reaction with water to create bicarbonate and H+ ions. This reaction is catalyzed by carbonic anhydrase II (CAII). The bicarbonate is reabsorbed via cellular exit through the anion exchanger 1 (AE1). The H+ is excreted via H+/K+-ATPase or H+-ATPase. Lastly, ammonia is transported into the tubule via the Rh C glycoprotein (RhCG) channel. Defects in H+ ion secretion, backflow of H+ ions into the cell, defects in AE1 or CAII or in ammonia production or transport can all lead to forms of distal RTA. Numerous transporters/exchangers and carbonic anhydrase II (CAII) are critical for H+ ion secretion by the α-intercalated cell (Figure 5). Defective function of one of several of these proteins can lead to inherited forms of distal RTA and include mutations in H+-ATPase, AE1 (bicarbonate-chloride exchanger), and CAII (26–29). Because CAII is also involved in proximal tubular acidification, defects in CAII lead to mixed proximal and distal RTA. Defects in H+ secretion can also be acquired, most often in association with autoimmune diseases, such as Sjögren syndrome, systemic lupus erythematosus, cryoglobulinemia, thyroiditis, and Graves disease (30–32). Sjögren syndrome is the autoimmune disorder most commonly associated with distal RTA; up to 3%–5% of patients will have overt distal RTA, and a much higher percentage (25%–35%) will have incomplete distal RTA (33–35). In the largest series of 130 patients with Sjögren syndrome, 95 patients developed some form of RTA; 91 of these patients had distal RTA (66 complete and 25 incomplete) (34). Four patients developed proximal RTA with Fanconi syndrome. A more recent series of patients with Sjögren syndrome demonstrated that proximal RTA may be more common than previously thought, with 57.6% of patients showing distal RTA and 42.3% of patients having proximal RTA (35). Most of these patients had ocular and dental symptoms consistent with the diagnosis of Sjögren syndrome. Of note, hypokalemia in these patients can be severe and may lead to hypokalemic paralysis (34,36,37). The mechanism of distal RTA in Sjögren syndrome is not completely elucidated. However, immune-mediated damage to the α-intercalated cell and specific proteins involved in H+ ion secretion is likely. Renal biopsies from these patients typically display tubulointerstitial nephritis with prominent plasma cell infiltration (38). Studies looking at specific proteins involved in acid excretion have demonstrated absence of the vacuolar H+-ATPase as well as the absence of AE1 in α-intercalated cells (39,40). Antibodies to CAII are also found in the serum of patients with Sjögren syndrome and mean antibody levels to CAII are higher in those patients with RTA, although these levels substantially overlap between patients with and without RTA (41). In support of the possible pathogenic role of anti-CAII antibodies, mice injected with human CAII develop antibodies to this protein and develop a syndrome similar to Sjögren syndrome with lymphocytic and plasma cell infiltration in the salivary glands and kidneys along with a urinary acidification defect (42). However, it is not clear that immunosuppressive therapy improves the RTA associated with Sjögren syndrome (43). Thus, in this case, the findings strongly suggest distal RTA associated with Sjögren syndrome and diagnostic testing for autoantibodies associated with this disease (anti-SSA and -SSB) is warranted. The history of nephrolithiasis is also typical of distal RTA (44). In the presence of metabolic acidosis, the bone serves as an important buffer and exchanges H+ ions for sodium, calcium, and potassium that are complexed to carbonates and phosphates (44). Over time, this leads to increased bone resorption with increased calcium and phosphate release and hypercalciuria with hyperphosphaturia. Compounding this is that metabolic acidosis leads to increased citrate resorption in the proximal tubule and a decrease in urine citrate, a prime inhibitor of stone formation (45). Finally, the alkaline pH of the urine fosters precipitation of calcium phosphate, leading to stones and/or nephrocalcinosis. Regarding the incorrect choices, serum and urine protein electrophoresis would be helpful in the setting of isolated proximal RTA, which can be associated with multiple myeloma. Serum renin and aldosterone levels may be of utility in the diagnosis of hyperkalemic type 4 RTA, while a serum cortisol level would be helpful in diagnosing adrenal insufficiency (which can be associated with hypoaldosteronism if the defect is at the level of the adrenal gland). In these cases of primary adrenal failure, type 4 RTA may be present. 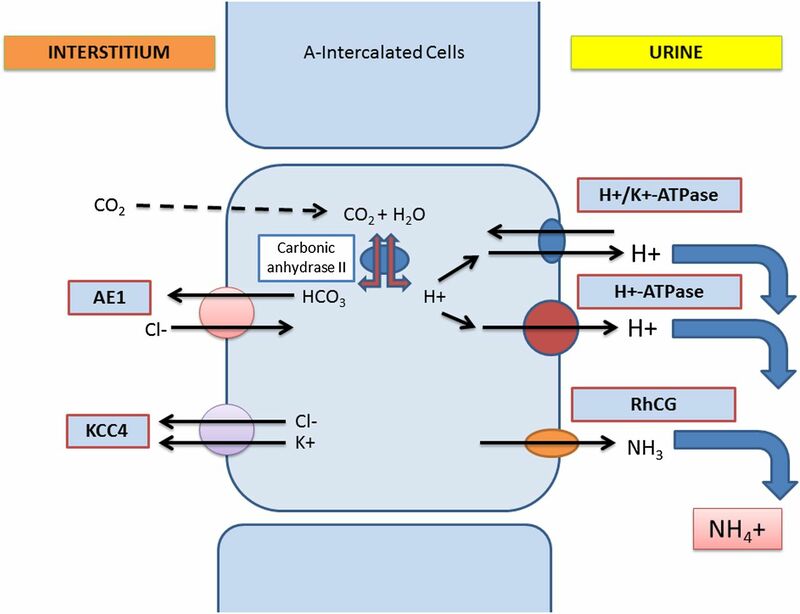 Finally, laxative abuse can be associated with a non–anion gap acidosis but because renal compensatory mechanisms are intact and urine ammonium levels are increased, the urine anion gap is typically negative. Aggressive intravenous potassium chloride and oral potassium citrate supplementation are administered. Laboratory tests repeated 1 week later reveal the following: potassium, 3.5 mEq/L; bicarbonate, 15 mEq/L; and anion gap, 6. The patient is seen by a neurologist for her chronic headaches, and topiramate, 200 mg daily, is started. Which of the following changes would be expected if laboratory work was repeated several weeks after initiation of topiramate? Figure 6 shows responses from fellows, training program directors, and audience. Answer for Case 2, Question 2b; Which of the following changes would be expected if laboratory work was repeated several weeks after starting topiramate? The correct answer (*) is A. TPD, training program director. Topiramate is a commonly used prescription drug indicated to prevent seizures and migraine prophylaxis. It is also increasingly used in the management of obesity (46). Early observations of patients taking topiramate showed that it was associated with both a non–anion gap metabolic acidosis and an increased incidence of calcium phosphate kidney stones (47–49). In clinical trials, 32% of patients treated with topiramate developed a serum bicarbonate <20 mEq/L compared with 1% of placebo recipients; on average, bicarbonate levels fell 5 mEq/L once the medication was started (47–49). Typically, in otherwise normal individuals, the non–anion gap metabolic acidosis was associated with alkaline urine, a positive urine anion gap, and a low urine citrate (47–49). In fact, topiramate is an inhibitor of several carbonic anhydrase isoenzymes and most potent at inhibiting isoenzymes II and IV (50). Of note, topiramate is approximately 10- to 100-fold less potent at inhibiting CAII than acetazolamide (50). Given that CAII is located on both the proximal and distal tubule and critically involved in acid-base homeostasis, topiramate leads to mixed proximal and distal RTA, mostly through inhibition of the CAII isoenzyme. Thus, in a patient with a preexisting distal RTA from Sjögren syndrome, the addition of topiramate is likely to exacerbate the non–anion gap acidosis, leading to a further decrease in serum bicarbonate (choice A is correct). The etiology of hypokalemia associated with distal RTA remains uncertain. One theory is that potassium-sodium exchange is stimulated due to an inability of the distal tubule to establish the normal H+ ion gradient between the tubular lumen and the peritubular region (51). Thus, the gradient restriction on renal H+ ion secretion reduces the rate of sodium-hydrogen ion exchange and sodium-potassium exchange increases reciprocally. However, data supporting this view are scant and conflicting, and correction of the acidosis alone with alkali therapy does not seem to reverse the potassium wasting (52). Another theory postulates hyperreninemia (perhaps due to subclinical volume depletion from impaired sodium conservation at the distal tubule) stimulates aldosterone secretion with concomitant potassium wasting (52,53). Other theories also exist to explain this issue (54). In any event, the potassium wasting can be severe and lead to hypokalemic paralysis (36,37). In this patient, the addition of topiramate effectively led to the development of proximal RTA as well as possibly worsening of the distal RTA (due to complementary defects in distal acidification from the drug and from Sjögren syndrome). In proximal (type 2) RTA, hypokalemia is thought to result from the reduction in the rate at which the proximal tubule reabsorbs bicarbonate, with the resulting distal delivery of high levels of bicarbonate to the distal tubule, where it cannot be reabsorbed. The presence of this nonreabsorbed anion necessitates its excretion with a cation (sodium or potassium due to the increase in intraluminal negativity). The loss of sodium bicarbonate in the urine may also lead to slight volume depletion and secondary rises in aldosterone, which further increase potassium wasting (55). Thus, the patient developed severe potassium wasting despite potassium supplements and required stopping of the topiramate to improve the hypokalemia and worsening metabolic acidosis. Regarding the incorrect choices, the potassium and bicarbonate level would not be expected to be normal and the anion gap would be in the normal range in the presence of a combined distal and proximal RTA. Thus, options B, C, D, and E are not correct.